The Hybrid Controller PRO uses a software-based technology, combined with a 5 step mechanical system for speed control of the ventilation system. It is designed to maintain a constant temperature, and to keep the air flow under control at all times. The presence of a heavy duty 5 step transformer makes the Hybrid Controller PRO the most reliable and silent controller on the market that guarantees no buzzing or humming from your fans even at the lowest speeds. In addition, the PRO software on the Hybrid Controller will also keep humidity in your room under control during the dark cycle - when it matters the most! Always choose fans with a difference in airflow capacity. For example, choose a 1500m3/hr and a 3000m3/hr. The ventilation system will now automatically create the correct negative air pressure. Note that the smaller fan is connected to the ''FAN AIR IN'' power outlet and the larger fan to the '' FAN AIR OUT '' power outlet. Of course you can connect only a single fan if required. Connect a fan of no more than the total amps of the controller to the '' FAN AIR OUT '' power outlet. The Hybrid Controller PRO will automatically step the fans to the appropriate speed necessary to maintain the set temperature. 5 . Place the temperature sensor in your room. Note; do not place in direct airflow or directly under a light source. 7 . 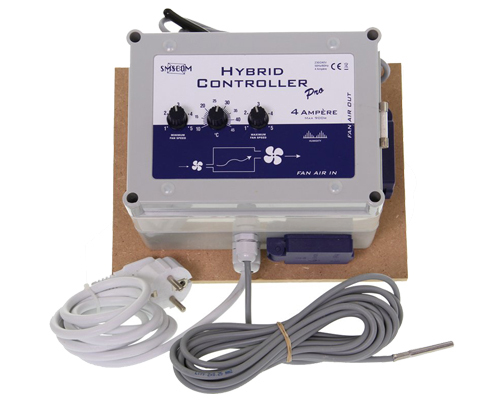 Now connect the Hybrid Controller PRO to the mains power source. As long as the cap is not removed, the PRO function will not be activated. Use the PRO feature only when humidity control is critical. The PRO feature ensures that extra air is refreshed at night, even if the temperature does not require more ventilation. As soon as the sensor detects that it is dark, the fans will run 1 step faster than the current setting, every hour for 7 minutes. The high humidity that occurs overnight will thus be removed from the room. By just this slight increase in the speed of the fans, the temperature, especially in the cold winter months, will not be adversely affected. Because moisture problems generally only occur at night, as soon as the light turns on again the PRO function will turn off and the controller will run in the normal mode. Please note that, once the PRO feature is activated, you only can disable this function by a reset. (Unplug the power plug from the outlet briefly, replace the cap on the sensor, and then plug back in).